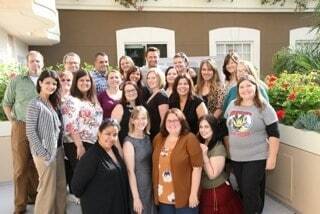 Hugh Jackman was the last interview of our day at the Real Steel press junket, and everyone who had come in before him had the nicest things to say about him. This was the moment I had been looking forward to for weeks, and it had finally arrived. When Hugh walked into the room, he had a huge grin on his face, was very relaxed, and settled in with ease to chat with us about Real Steel. First up, we asked him what it was like working with this particular film crew, and how important his reputation is to him . “I think your job is to bring people together. Like it’s a team — acting, filmmaking is definitel a tyeam effort…you become like an instant family. It’s really amazing how quickly you bond, you know… Shawn has become one of my closest friends,” Hugh said of his experience working with Shawn Levy and the film crew. Hugh also made a huge impact on Levy’s youngest daughter, who has a small speaking role at the beginning of Real Steel. Levy’s daughter wrote Jackman a love letter, and Hugh even called her on her 4th birthday to wish her a happy birthday. Hugh also took other members of his family, all different age ranges, and was pleased at their reaction to Real Steel. “ I saw the movie with my mother-in-law, who’s 75, and my wife…And all of them were cheering and they were like crying and they just — they just loved it. It was a really great moment for me, you know, to genuinely have all those three generations loving it.” Real Steel is marketed as a family film, and there truly is something for everyone to enjoy in it. It’s important to Jackman that his kids not be exposed to movies and media that they are not ready for. His 11-year-old still has not seen the X-Men films, and is actually afraid of the Harry Potter films. Hugh’s father was actually very strict about the films that Hugh and his siblings would see as children. “I was the only kid not to see Star Wars…that movie came out when I was seven. I saw that movie like six years later.” Jackman’s father adhered strictly to the ratings; if it was rated PG-13, Jackman would be allowed to see it when he turned 13. Real Steel is currently playing in theatres everywhere. If you haven’t had the chance yet, go and see it! It’s a film that your whole family can enjoy. To get the latest updates on Real Steel, follow @realsteelmovie on Twitter, and keep up with Hugh Jackman on Twitter as well @RealHughJackman. Free Comparison Shopping with Digital Folio + Twitter Party! I <3 Hugh Jackman. Thanks for sharing! !